Come on, even I have a Flat Dark Earth (also known as coyote tan) Beretta 92 S. Which also has a threaded barrel. Rounds out my 92 collection nicely. The sights are low profile but dead on. Just need to run across an original 92 F to go with the SB, M9 and 8045 Cougar which actually a Stoeger, but that makes it a little more special/rare in my book. The stainless 84 Cheetah is just icing for a 380. But that 19X looks pretty tempting for entering a striker fired to the collection. Still wanting a FNX in 45 though. But not sure if I would like the weight of 15 rounds of 45. And having that balance change while shooting. I'm in England and only ever used longs. Colour reminds me of the fictional handgun Gun from Goldeneye 64. That was The Man with the Golden Gun. 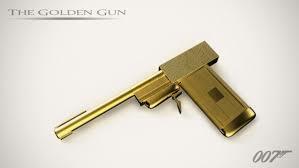 Yeah, but in the game you could get the golden gun, 1 shot, 1 kill. Wouldn't a Glock 19 with a 17rnd mag and a sleeve to fill the gap essentially be the same thing? Like the sleeve the S&W shield has on it's magazine. Does it have a shiny or matte finish? I can't tell from the photo. Best I can describe it is "Mildly Matte"
I like that extended beaver tail with the shorter slide. It just dresses the Glock up a bit. And just looks like it would be more comfortable. Definitely adds to the comfort of shooting it..
Kind of but not quite.. Most extended mags only support the front, ie. fingers, this supports the whole hand.. I think it's a perfectly good color. Maybe people are confusing it with gold. This is sand colored and it is in matte. It will not reflect sunlight, so it will neither make you out nor reflect in your eyes during use. Nickle would do that and is therefore not used by professionals. But it will blend in when in an environment it's meant for.